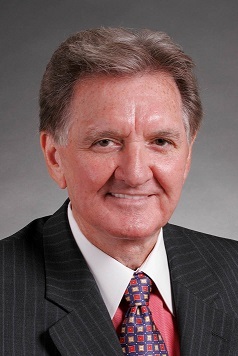 Dr. Jerry C. Hudson is the retired founding dean of the College of Media and Communication at Texas Tech University. He holds a bachelor’s and a Master’s degree from West Texas A&M University and a Ph.D. from the University of North Texas. He is the author or co-author of 50 papers, six book chapters and more than 30 publications and proceedings. His research concentration is in dissemination of health care information and Hispanic media use and consumerism. His experience includes commercial broadcasting including radio and television sales, radio personality, television sports personality and weather person. He has served as a research consultant on more than one hundred marketing/advertising projects including research and marketing plans for banks, hospitals, media companies, political candidates, shopping malls and retail stores. He also served as the Media Director, U.S. Department of Labor, JECOR/VOTRAKON Project, Riyadh, Saudi Arabia. Prior to joining Texas Tech University, Dr. Hudson was director of mass communications at Lamar University. At Texas Tech, he served as director of the School of Mass Communications; coordinator of graduate studies and director of the Institute of Communication Research; and founding dean of the College of Mass Communications. Dr. Hudson has served as president of the Texas Association of Broadcast Educators and the Southwest Council of Journalism and Mass Communications. He has been recognized by three different university committees for teaching excellence. In 1995, he was awarded the President's Academic Achievement award. The American Advertising Federation's 10th District honored Dr. Hudson in 1995 as the Outstanding Advertising Educator. The Lubbock Advertising Federation awarded him the Silver Medal Award in 2002.
established the Instituted for Hispanic and International Communication and the Center for Communication Research; and established funding for two Regents Professorships. The college increased its full-time faculty positions from 21 to 38, part-time faculty from six to 13, and its full-time staff positions from five to 18. The annual college student credit hours increased 40 percent between 2004 and 2013. The college annual graduate enrollment increased from 21 Master’s and zero Ph.D. students in 2004 to more than 90 doctoral and Master’s students by fall 2013. The college had the highest retention rate among all colleges in the university. The college endowments increased by more than 500 percent between 2004 and 2013 ($1.5M in 2004 to more than $8M by fall 2013).